The whole point of installing a home weather station is to get an accurate and reliable measurement of the weather around you. If you install it wrong, you may as well be relying on regular weather apps and news forecasts. If your home weather station’s sensors are not positioned correctly, then you can be certain that you will have messed up measurements, thus rendering your device useless. Are you wondering where to place outdoor weather sensors? We’ve got that covered. It’s important to sit your weather station in the right place, as this can ensure that you will be collecting accurate readings all year round. One of the most significant issues with installation is placing your weather sensor in the wrong area that gives inaccurate temperature readings. When choosing where to put your temperature sensor, it’s best to determine a spot that has proper ventilation. The reason for this is because sensors can overheat and malfunction. Hence, ensuring that the area is well-ventilated will keep it from showing higher readings and from overheating. A detector should never be placed into direct sunlight. This can give an inaccurate reading and cause the temperature to be up to 20 degrees higher. If you’re placing it on your roof, you will need to set it at least five feet above the roof. This will help ensure that it doesn’t get blocked. If you’re placing it on the ground, make sure it’s five feet above the grass. Thermometers should only be 50 feet away from paved surfaces to ensure reliability. We always suggest that you place a radiation shield on your thermometer because it can help block out direct sunlight. This can help if you live in a very sunny environment that is prone to overheating. A radiation shield helps block out UV rays, temperatures, and heat, which keeps the sensor ventilated and functioning correctly. However, if your temperature sensor already has an aspirator fan, then you can skip placing on a radiation shield. If you can’t afford or don’t want to fork out the extra money for a radiation shield, you may also make one using aluminum sheets. These need to be placed at least six inches away from the temperature sensor and should shield the device from any direct sunlight. When determining where to place your humidity sensors, you may want to consider how close it is to plant life and large bodies of water. These factors impact the humidity measurements, which can give you an inaccurate reading. As a general rule, you will want to place your humidity sensor at least 50 feet away from either of those two factors. Obviously, a rain gauge needs to be in a location where it can gather water. If the weather station is placed too close to a building or has any foliage in the way, then the rain gauge won’t work properly. The same can be said about buildings. If there is a huge building blocking the rain collector, then some of the rain that usually would go into the collector may end up on the building instead. Either way, you will want to place it five feet away from a building or foliage. If the building is taller, then you may want to set it at least 10 feet away from any objects. This will ensure that your rain collector picks up all the rain and can give you an accurate reading of rainfall. The last factor to consider is the wind. 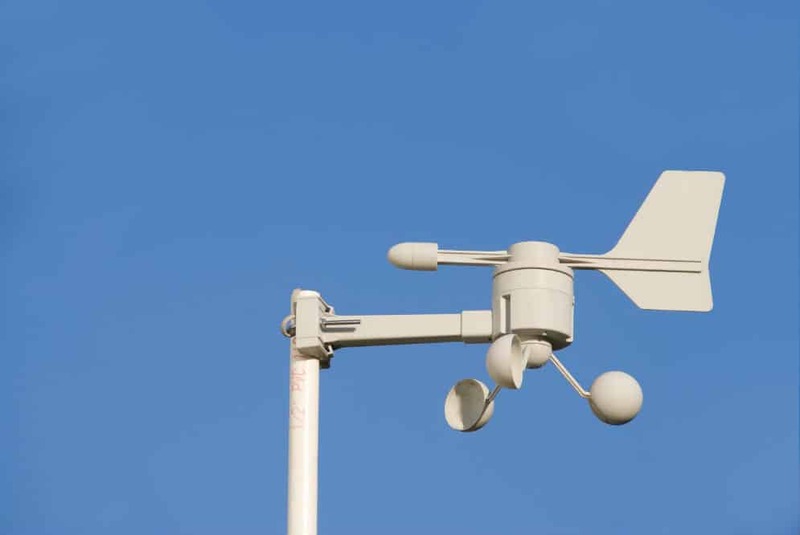 An anemometer will help track wind speeds and direction and is usually placed in a vast open space. However, because a home weather station has multiple sensors and needs to be closer to your home, you may need to place it in a less open area. As a general rule, it’s best to place a wind anemometer 10 meters above the ground. That’s why a rooftop is ideal for an anemometer sensor. This will measure the wind speeds and ensure that no other factors are interfering with the measurements. However, if you can’t place it that high, then at least try to put it as high as you’re comfortable with. Other than that, you will also want to try and keep other tall items away from the anemometer. Any object that is blocking the way or is at the same height may influence its readings. A golden rule to follow is to place the anemometer at least seven feet away from any other objects. This will give you the best and most accurate reading. If you can’t do that, then at least make sure that it’s placed higher than the objects around it. After reading all of that, you may be more confused than ever as to where to place outdoor weather sensors. It can be intimidating to make a choice and then find out that you set it in a lousy location. If you want to avoid this, then allow us to recommend some of the best places for you to place your weather station. The most popular location is on your rooftop, above all other objects. Always keep it five feet above the roof, as this will ensure that no other objects are blocking its way. It also provides that the house won’t interrupt any readings for the wind. Why is a rooftop an ideal place? Well, it’s because it doesn’t have any object blocking the weather station. There is also no foliage or water, and you can place a shield to help block out direct sunlight. However, not everyone can install one onto their roof. If that’s the case with you, then we can also recommend placing it on a pole in the middle of your backyard or front yard. A pole will help elevate the system and ensure that no other objects are disrupting the readings. You may have already placed yours in the wrong location and thought that the device was malfunctioning. Hopefully, this article helps you find a new place to set up your weather station. As you may have noticed, there are various rules to follow as well as different places where you can install your weather station. Keep in mind that the position plays the most significant factor on whether or not you’re getting accurate readings.